The massive blizzard that buried the East Coast over the weekend dumped more than 20 inches of snow on Washington, D.C., and left city officials to ponder a question all too familiar to their counterparts in Boston: What do we do with all this snow? Their answer: Call in the Snow Dragon. CBS News reports that the nation's capital called in a giant snow melter — aka the Snow Dragon — from Indianapolis to help in its snow removal efforts. So what exactly is a Snow Dragon, you ask? Snow and ice are deposited onto a melting pan that is fabricated above a hot water bath, containing heat exchanger tubes. The burner fires into the tubes heating the water, similar to a boiler burner type system. This creates a 100% totally enclosed system, thus not allowing any burner/flame contaminants to be introduced to the discharge or water bath. As snow is dumped onto the melting pan, warm water is sprayed over the snow. As the snow melts, it travels down the pan, through a screening process into the debris catch area and back into the water hopper to be re-heated. 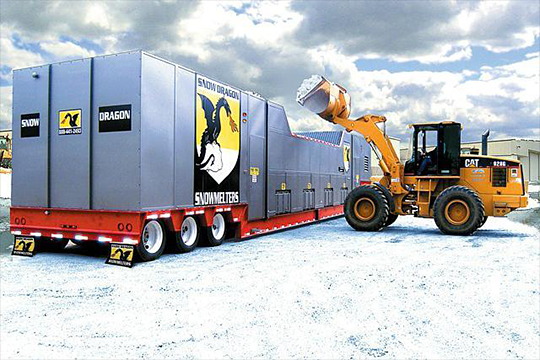 The SND5400 model, which is designed for municipal use, can melt 180 tons of snow per hour. And because of the cost associated with traditional snow removal, Snow Dragons are becoming more common. In Philadelphia, the Southeastern Pennsylvania Transportation Authority (SEPTA) purchased one earlier this winter. Over the weekend, the "rail-riding, snow-throwing monster truck with a rotating arm" was used to help clear the city's rail lines. “Two feet of snow is a lot to move," Chris T. Geldart, director of D.C.'s Homeland Security and Emergency Management Agency, said Sunday. According to the Washington Post, the volume of snow that fell in the District was approximately 3.49 billion cubic feet — or the equivalent of a 3,087-foot-tall, 1,204-foot-wide pile. Of course, D.C. isn't relying on its borrowed Snow Dragon alone. According to the District's Department of Public Works, 345 pieces of equipment — including 150 plows — and 750 personnel were dispatched to respond to the blizzard. And trucks are being used to haul snow removed from D.C.'s streets and pile it in the parking lot of RFK Stadium, where it is left to melt or, in this case, be melted. Last week, D.C. Mayor Muriel Bowser apologized for "an inadequate response" after an inch of snow that fell ahead of the blizzard crippled the capital. "We believe that we did not provide adequate resources at a time when it could make a difference in last evening's commute," Bowser said at a news conference Thursday. But Bowser is trying to make up for it, tweeting frequent updates on the city's snow removal progress and allowing residents to monitor the response with an online plow tracker. Gaby Rochino knew she wasn't the only Rowan University student struggling to get through a particularly difficult engineering class - "I'd study nine hours a night and I'd still get a C on a quiz" - but she still felt alone. "Imagine sitting in a classroom, and nobody in your classroom looks like you. Rowan itself is very un-diverse, so mostly everyone around me was a Caucasian male," said Rochino, 21, of Cherry Hill. "It's just devastating looking around the room, thinking, 'Maybe I'm not cut out for this, maybe I'm not made for this, maybe girls can't do engineering,' " she said. But that goes against everything Rochino believes and everything she's been taught by her family and seen in her years at Rowan. Her project, a series of "Think Like a Girl" engineering activities kits for girls age 6 through 12, also netted $5,000 in seed money from the Rowan Innovation Venture Fund that she and two cofounders can use to continue developing the kits via a student-run engineering clinic. Each themed kit has a core engineering activity that uses common household items. For instance, a prototype structural engineering kit themed around Paris uses gumdrops and toothpicks. A "Real Woman Engineer Trading Card" in each box helps give girls role models, as does fictional Gaby Gadget, the girls' guide through the box. Other pieces include a design project, meant to encourage creative and artistic thinking, and a sustainability fact card to promote awareness of environmental impact. "Every single component you see here, there's a reason as to why it's here, trying to combat one of the issues why girls don't go into engineering, or how they learn best," said Lexi Basantis, 20, of Medford Lakes, a junior mechanical engineering student and cofounder. Tony Lowman, dean of the engineering school, said gender disparity is a challenge at schools and companies across the nation. "We're not attracting the women, and we're trying hard," he said. "And it's stories like this that are what's going to do it: these are highly successful women who are highly entrepreneurial, they're intelligent, they're outstanding engineers, they're a shining example." Last semester, Rochino led two other mechanical engineers, two civil engineers, and a chemical engineer to flesh out two dozen kits, which they hope to sell sometime next year. 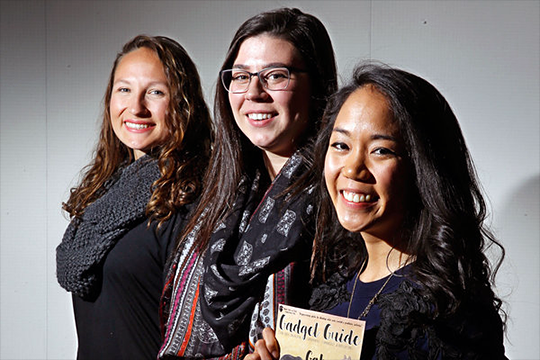 The engineering clinic has a few more students this semester, and the Think Like A Girl team is looking to add students from other fields as consultants. Ultimately, the cofounders hope to launch a start-up, with help from competitions and money from a crowdfunding campaign. The kits will roll out as a subscription service, with boxes shipped out each month. 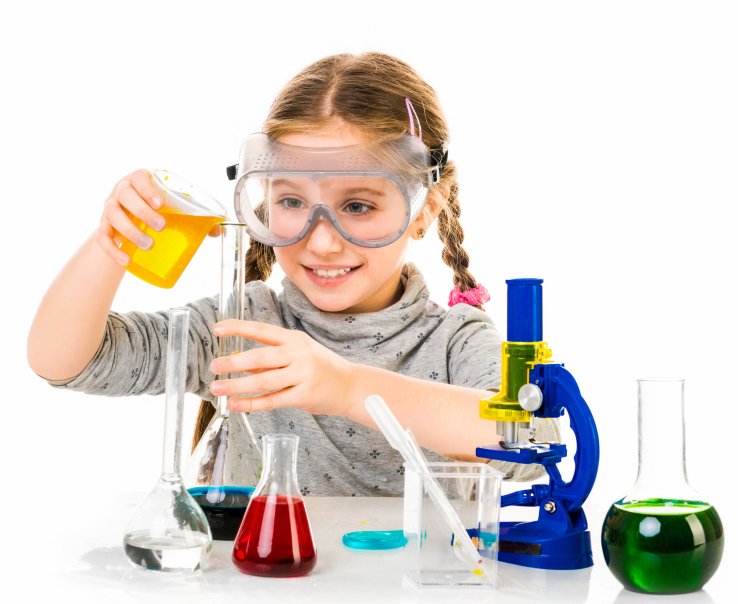 Each kit addresses specific reasons - backed by academic research - that girls turn away from engineering and science. "Some of the main reasons why girls don't go into engineering are misconceptions of what it is to be an engineer and lack of female role models," said Megan DeGeorge, 22, of East Greenwich, another mechanical engineering student who is a senior and Think Like A Girl cofounder. Existing products, including construction toys meant to be gender-neutral or even aimed at girls, don't meet those needs, DeGeorge said, citing market research. "There's nothing that relates to those things. So yeah, you can make little pink and purple toys that snap together that girls will like to play with," she said, "but if there's not storytelling, role-playing along with it, there's not a connection to the real engineering, and there's not a woman role model, then it doesn't matter." After Rochino talked about feeling alone in her engineering class, DeGeorge talked about another challenge: What happens when you succeed. "When you finally have a break and you get offered an amazing job or an internship, you get that taken away, because people tell you it's only because you're a woman," DeGeorge said. "So you can't do it, because you're a woman, and when you can do it, it's only because you're a woman." Basantis jumped in, quoting classmates: " 'You're the diversity hire.' "
Rochino, who calls those students "some jerks," also draws inspiration from a network of mentors drawn from the faculty at Rowan and industry partners. Internships at Dassault Systemes SolidWorks connected Rochino with Marie Planchard, the company's director of education portfolio and a Rutgers-New Brunswick engineering alumna. Planchard encouraged the Think Like A Girl team to avoid pink and purple colors on their kits, leading them to teal and orange instead. When Planchard graduated from Rutgers with her mechanical engineering degree in 1983, she said, there was a push to get more women in engineering. But today, women make up just 14 percent of engineers in the United States, according to a 2012 report by the Congressional Joint Economic Committee. "If we don't get 50 percent of our population to be interested in solving problems, we're going to be in real trouble as a society. And that ability, to solve problems and to think about solving problems, starts when you're very young," Planchard said. "I'm just hoping the next generation, like Gaby and Think Like A Girl, has figured this out, because it is going to take another generation to get this to happen." The New York side of Niagara Falls may be "dewatered" in the next two to three years in order to replace two bridges that date back 115 years. 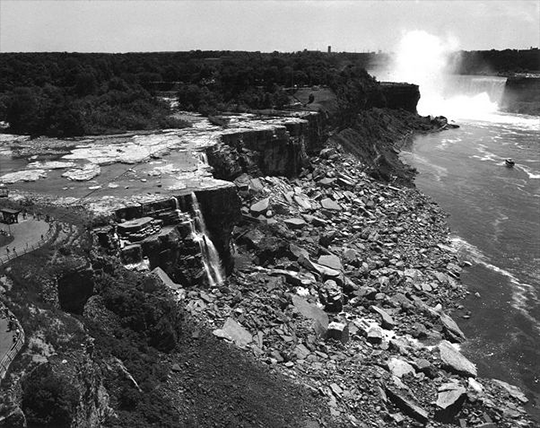 The last time Niagara Falls went dry was in 1969 in order to study the effects of erosion and rock buildup at the bottom of the American side of the falls. The two stone arch bridges allow pedestrians and vehicles to get to and from Goat Island, which stands between the Bridal Veil Falls and the Horseshoe Falls in the Niagara River. If the plan goes through, all the water from the American side of the falls will temporarily be diverted to Horseshoe Falls in Canada using a cofferdam. 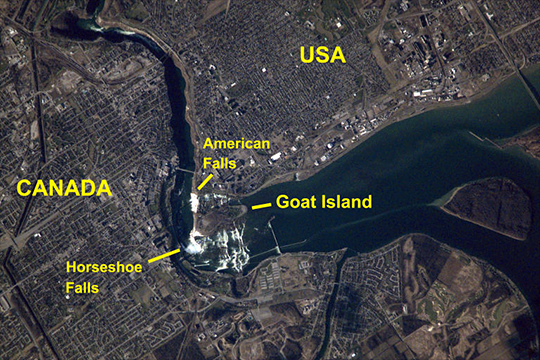 Former Niagara Falls city historian Michelle Kratts claims that people came from all over the world to see the falls when they were shut off in 1969. "It's the nature of curiosity," she said. "You want to see what's underneath, to see its skeleton." The plan to shut off the falls will be proposed at a public hearing this Wednesday at the Niagara Falls Conference Center. If you're a die-hard morning person, don't start packing your bags for Mars just yet. A recent study suggests that people who prefer to sleep in and stay up late may be better suited for Mars. Our bodies have internal clocks that tell us how long a day is, and we're all set to somewhere just around 24 hours. But there's evidence that early risers' internal body clocks that run a little faster than average, while night-owls' clocks run a little slower. And since a day on Mars is about 37 minutes longer than 24 hours, those with a slower body clock (that is, one that takes longer than 24 hours to complete a natural cycle) may find the adjustment to Mars time easier. Telegraph reporter Sarah Knapton made this connection after seeing the findings from a recent Proceedings of the National Academy of Sciences article. The study found that mice whose internal clocks ran faster than Earth's 24-hour day did not survive and thrive as well as mice whose clocks were synced with the Earth's rotation. For those mice, it probably felt like Daylight Savings every day--i.e. not very fun--and in fact they died out after a few generations. The study underlines the importance of syncing your body clock with the rotation of the planet you're on. “The rotation speed of Mars may be within the limits of some people’s internal clock, but people with short running clocks, such as extreme morning types, are likely to face serious intractable long-term problems, and would perhaps be excluded from any plans NASA has to send humans to Mars." Know who else might not be invited to Mars? Vegans, the gluten-intolerant, and other folks with extreme dietary restrictions. As NASA food scientist Vicky Kloeris told Popular Science earlier this month, it isn't easy designing the food for Mars. Assuming NASA can get the food to stay palatable and nutritious after the long journey to Mars, the space agency plans to feed Martians the same stuff that it feeds the astronauts on the International Space Station--which wasn't designed with any finicky dietary needs in mind. 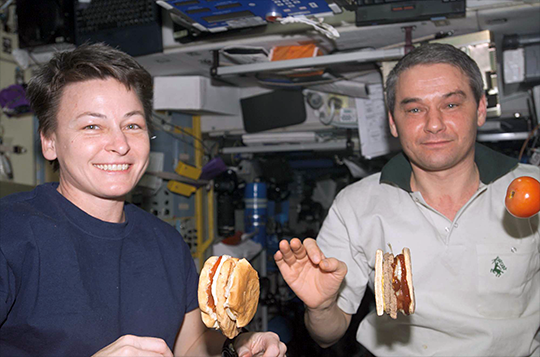 Designing a balanced and varied diet for a vegan or gluten-intolerant astronaut would mean that Kloeris and her colleagues would have to cook up a whole new menu for that astronaut, as well as run the new food items through various tests to make sure they'll stay fresh and yummy in space. "Could it be done?" asks Kloeris. "Yes. But if you were to send a vegan or someone who is gluten-intolerant or severely lactose-intolerant, you would have to make an enormous amount of special accommodations for that person. That would cost a lot of extra money. So that would be a decision that NASA would have to make." Considering NASA's plan to get to Mars is already adding up to be pretty pricey, we wouldn't count on that. So if you have a peanut allergy or absolutely can't eat gluten or dairy products, maybe save yourself the trouble of applying to be an astronaut. When it comes to digesting its prey, the plant is a calculating killer. If you accidentally get transformed into a fly, and get caught in a Venus flytrap, here is some valuable advice: Don’t panic. Hedrich and others have found that the Venus flytrap can count the number of times that its victims touch the sensory hairs on its leaves. One touch does nothing. Two closes the trap. Three primes the trap for digestion. And five, according to Hedrich’s latest study, triggers the production of digestive enzymes—and more touches mean more enzymes. The plant apportions its digestive efforts according to the struggles of its prey. And the fly, by fighting for its life, tells the plant to start killing it, and how vigorously to do so. The Venus flytrap has captivated scientists for centuries, perhaps because of how un-plant-like it is. It captures and eats animals. Its leaves look unnervingly like fang-lined mouths. It moves quickly, with each of its traps closing shut in a tenth of a second. It has, on occasion, a fantastic singing voice. It is, as Charles Darwin said, “one of the most wonderful [plants] in the world.” To understand his admiration, it helps to slow things down, and see exactly what happens when the flytrap traps. We start with a fly. It lands within the open halves of the flytrap’s trap, drawn there by the red color and fruity smell. The inner surfaces of the traps are minefields, dotted with stiff hairs. When one of these is bumped by a bumbling fly, it triggers a spike of calcium ions that send an electrical impulse through the lobes, much like those that travel along your neurons. A single impulse means nothing; it could be triggered by wind-blown debris hitting a hair, or perhaps a falling raindrop. To avoid closing its traps for such false alarms, the flytrap is programmed to await a second signal. The first impulse sets a secret timer, and what the fly does in the next 20 seconds will determine its fate. If it avoids the hairs, it will live. If it bumps a second one, it sets off another electrical impulse, which raises the trap’s calcium levels above a critical threshold. The plant responds by sending water into its leaves, which rapidly change shape from convex (bent outwards) to concave (bent inwards). In other words, the trap snaps shut. The fly, by fighting for its life, tells the plant to start killing it, and how vigorously to do so. The fly is imprisoned but not dead. It struggles, knocking the trigger hairs even further and sending off more electrical impulses, around one per minute. The third impulse raises the trap’s calcium levels even further, prompting it to produce a hormone called jasmonate. In many plants, jasmonate is a touch hormone, which is released by wounds and injuries and coordinates programs of defense and repair. In the Venus fly trap, jasmonate doubles as a carnivory hormone. It primes the gland cells in the trap to start making digestive enzymes, which they finally do once they detect a fifth electrical impulse. The plant carefully calibrates the supply of these enzymes to meet the demand for them. A large fly struggles more furiously, knocks more trigger hairs, and sets off more electrical impulses. The plant responds by making proportionally more jasmonate, and secreting proportionally more digestive enzymes. The stomach takes several days to digest the dead fly, and the flytrap keeps up the assault of acid and enzymes by tasting its meal. The dead fly isn’t setting off any electrical impulses any more, but in as-yet-unpublished work, Hedrich has shown that the trap is also lined with chemical sensors. These can detect the chitin in the fly’s shell and the substances in its blood. So, as long as the plant can taste something to digest, it will keep digesting. It also starts absorbing, doing the job of intestines as well as a stomach. The same five electrical impulses that trigger the production of digestive enzymes also activate a set of transporter enzymes, which absorb the sodium liberated from the disintegrating fly. 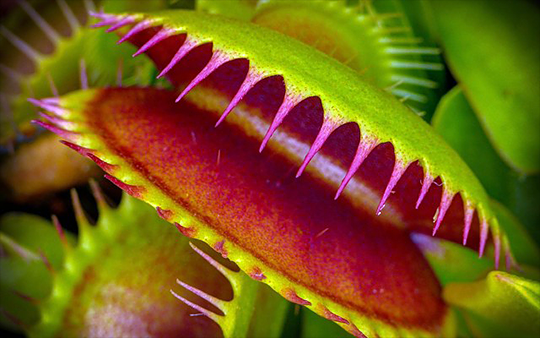 Most plants detest salt, but the flytrap puts it to good use. By concentrating it within the traps, it can drag the water from the fly into its own tissues. After a week or more, the trap opens, revealing the fly’s empty husk, which eventually falls out or blows away. The trap is now set for another victim. It will capture one or two more before the plant replaces it. Many of these details have been known for a long time, says Andrej Pavlovic from Comenius University in Bratislava. But Hedrich’s latest study finally shows that the flytrap can count electrical impulses to induce the digestive process. How it does so is still a mystery, and one that the team is actively trying to solve. For now, it is clear that the plant is a paragon of efficiency. It ensures that it wastes no energy in capturing victims. It only closes its traps when it likely has a meal. It only starts producing fluids when it’s really sure that it has caught something. And it only continues digesting when there’s something to digest. And in doing so, it can thrive in nutrient-poor swamps and marshes where other plants struggle. Forty-five thousand years ago, there were no space heaters or snowmobiles or waterproof boots. But there were people living in the Siberian Arctic, scientists have discovered, and they were living there millennia earlier and much further north than recent conventional wisdom would have it. Mammoth and wolf bones unearthed in northern Siberia and dating from near the end of the Pleistocene were scarred by human weapons, scientists announced in this week’s Science. The next oldest evidence that humans survived in the Arctic dates to 35,000 years ago. Other research has shown that Homo sapiens wandered out of Africa, the birthplace of our species, all the way to Siberia by 45,000 years ago, but that evidence placed people only as high as 55 degrees north, about the same latitude as Edinburgh. Russian archaeologist Vladimir Pitulko thought humans must have pushed further northward the Arctic Circle, but conditions in Siberia tend to defeat scientific ambition. Travel is by helicopter, and frozen soils may force excavation crews to blast dig sites with hot water. But luck was on Pitulko’s side. 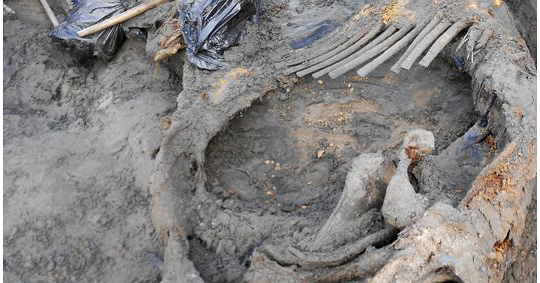 In 2012, a 12-year-old boy found a mammoth skeleton close to the northern coast of Siberia. The top of the mammoth’s great hump measured more than seven feet high, and its bones bore multiple cuts and holes, some of them made by spear points or similar weapons. Part of the animal’s tusk had also been sliced away, which would’ve created long, sharp-edged slivers useful for cutting, said Pitulko, of the Russian Academy of Sciences. That ingenious technique may have been crucial for survival in the region, which lacks the kinds of stones that the first humans fashioned into knives and other tools. A wolf skeleton found elsewhere in the Siberian Arctic amid a cache of bison bones also showed signs of damage from a sharp weapon, Pitulko says. The wolf survived the injury. Perhaps it had been hanging around a human campsite, “hoping for some leftovers, and somebody just wanted to make him go away,” Pitulko speculated. The new finds add to evidence that humans settled northern Eurasia 40,000 to 50,000 years ago, said John Hoffecker of Institute of Arctic and Alpine Research at the University of Colorado, Boulder. Pitulko noted his new findings put humans within striking distance of the Bering Land Bridge, the now-submerged finger of land that once connected today’s Russia and Alaska. Humans made their way to the Americas from Siberia across the bridge some time after 30,000 years ago. One of the weaknesses of screen-based media is how inaccessible it can be for people with impaired vision, who must instead rely on screen readers and other specialized tools to speak aloud the words in an online article. A special touchscreen tablet, made by a team at the University of Michigan, aims to bring braille into the future, by creating a readably tactile surface. Developed in the 19th century in France by the code’s eponymous Louis Braille, the system was inspired by a military system that used raised dots to create a text soldiers could read with their fingers in the dark of night without using any light that could give away their position to the enemy. Braille’s codified system created words, letters, and characters out of a six-dot grid: two parallel rows each with three raised dots form a single Braille “cell.” Like any system of writing, it’s adapted to usage and time and often includes contractions and other shortcuts. In print and writing, braille is raised dots on paper, placed their by a machine or by a person using a slate and stylus. Translating that to machines has meant, for the most part, creating special braille readers that use a pin in place of each dot, which is raised or depressed to match the word it’s displaying. Think of pixels on a monochrome computer monitor, only a lot more cumbersome to create. There are braille devices that can turn text on a screen into readable braille, but they’re expensive and usually only show a single line of text at a time. That’s great for a 4-digit tool like this South Korean watch that displays in braille, but not so great if someone wants to read a book or even just an article. It also limits the kinds of information that people can read. Graphs, spreadsheets, charts of all kinds, or anything on a page showing a spatial relationship simply can’t be done in a single line reader. So University of Michigan Professor Sile O’Modhrain, together with associate professor Brent Gillespie and doctoral candidate Alexander Russomanno, are working on a pneumatic system that they hope will show a full page of braille. Instead of a pin system, it uses microfluidics, or the careful management of tiny amounts of a liquid or gas, to fill or leave bubbles on a planned tablet-like screen. This isn’t the first device to create a tactile experience on touchscreens. The Phorm touch screen by Tactus is a touch-screen add-on that creates physical buttons using microfluidics, though it doesn’t specifically advertise itself as a tool for braille. Still, doing more with the technology is always good, and the Michigan team expects that, in a couple years when their devices is ready for commercialization, it will have a market beyond just those who need it to help with vision impairments. An incredibly long-necked dinosaur, with leg bones the size of couches, is so massive that is has invaded not one, but two rooms at the American Museum of Natural History (AMNH) in New York City. The enormous titanosaur—an herbivorous beast that weighed 70 tons (64 metric tons) when alive some 100 million years ago—is the newest permanent exhibit to join the museum. It measures 122 feet (37 meters) long, almost the length of three school buses. The behemoth is so large it dwarfs the museum's famous model of the blue whale by nearly 30 feet (9 m). But the whale wins in heft; in real life, blue whales (Balaenoptera musculus) weigh up to 200 tons (180 metric tons), almost three times as much as the titanosaur, museum researchers said. The titanosaur dates to the Cretaceous period, but the dinosaur's modern story began in 2012. That's when a rancher in southern Argentina stopped by the Museum of Paleontology Egidio Feruglio in Argentina to disclose that he had found fossils on his land. In 2014, paleontologists visited the desert site by the farm of La Flecha and found a treasure trove of dinosaur remains. After 18 months of excavations, the researchers uncovered 223 fossilized bones from six individual titanosaur dinosaurs, including an 8-foot-tall (2.4 m) femur, or thighbone. The femur's unique shape and size suggest that the titanosaur is a new species and one of the largest dinosaurs ever uncovered, researchers told journalists today (Jan. 14). One of the dig's leaders, Diego Pol, earned his doctorate at a joint program between Columbia University in New York and the AMNH, in the lab of Mark Norell, the museum chair of paleontology. Soon after the dig began, Pol sent Norell a photo of himself lying on the dinosaur's gigantic femur, much like a person would recline on a living room couch, Michael Novacek, senior vice president and provost of science at the AMNH, told journalists. All of the individual dinosaurs discovered were young adults, identified as such because their neck vertebra hadn't fully fused together, as they do in adults, the researchers said. The young dinosaurs had died at three different moments in time, anywhere from a few years to centuries apart, the scientists said. It's possible that the titanosaurs were separated from their herd and died of stress and hunger, the researchers said. However, the study announcing the new species to the scientific community is about four months away from publication. This means that the researchers were unable to share the species name. Instead, they called it "the titanosaur," and explained how it came to reside in the museum. After excavating the fossils, researchers spent six months transforming 84 of the bones into 3D, lightweight fiberglass replicas. The scientists filled in the missing gaps, including the skull, by studying the bones of related dinosaurs. "The skulls of these kinds of sauropod dinosaurs are very rare," Norell told Live Science. "They're extremely fragile—the bones are really paper thin." Though they found a few elements of the fossilized skull, the researchers chose to model the skull after a few well-preserved skulls of smaller animals related to titanosaurs, and "scaled it up to the size that this animal would be," Norell said. In all, the titanosaur would have stood about 20 feet (about 6 m) tall at its shoulder, and 46 feet (14 m) tall with neck held at a 45-degree angle. The museum replica's neck is slightly lower, thanks to the approximately 19-foot-high (5.8 m) ceilings in the room. In addition to the replica, museumgoers can see original fossils of the dinosaur's humerus, ulna, radius and scapula, on temporary display. 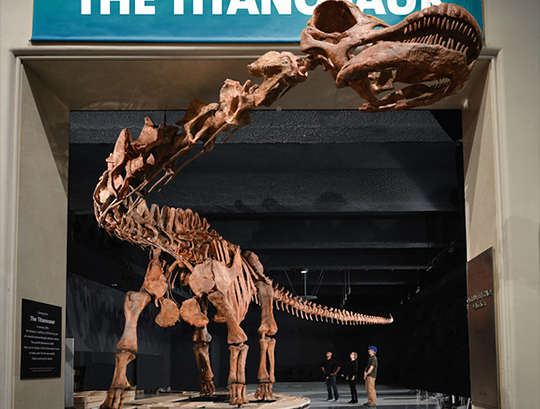 The entire exhibit, called "The Titanosaur," opens Friday (Jan. 15). Titanosaurs have been found on every continent of the world. The new exhibit replaces a Barosaurus, another long-necked, but smaller sauropod. Another upcoming exhibit at the museum, "Dinosaurs Among Us," is about the evolution of birds and opens to the public March 21. Math can teach us a lot about how to better eat pizza. 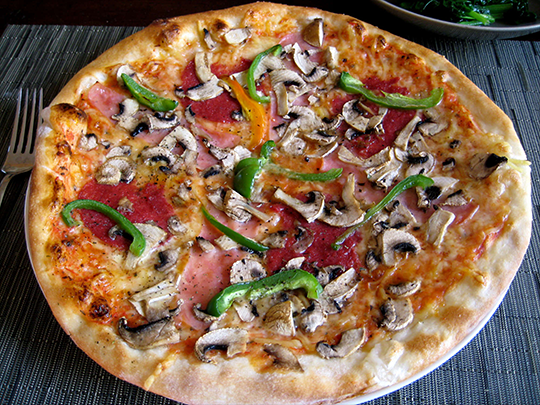 In 2013, a mathematician named Eugenia Cheng determined the formula for the perfect pizza size. And then for the best way of shoveling that perfect pie into your mouth (folded, obviously), you can turn to a 19th century mathematician. But what about that step in between making the pizza and eating it? You know, cutting it into the perfect (or at least visually interesting) slice. Well, math is here to help again. New Scientist writes about the research done by Joel Haddley and Stephen Worsley at the University of Liverpool. The two mathematicians were investigating monohedral tilings--a pattern in which all the tiles are the same shape. "Such tilings are produced on a daily basis by pizza chefs by taking radial cuts distributed evenly around the centre of the pizza," the researchers note in the paper. That's the traditional method of cutting where all the slices meet at the center of the pie. Mathematicians had previously come up with new ways to slice--without slighting anyone of course. That method created 12 slices (some with lots of crust, some with basically none; see above, left) that were all nevertheless congruent. But those were still three-sided slices. Haddley and Worsley thought they could do better than that. They discovered a way to slice curvy pieces with nearly an infinite number of sides (as long as it's an odd number of sides) and then further divide those slices in half. For a slightly flashier way to divide the disk, the researchers then gave each slice more complex shapes by creating wedges in the sides, still producing monohedral tilings that fit together into a circle. It's unclear how someone might actually perform this work of complex pizza art in real life, but one could imagine it requires lots of patience, precise tools, and of course, pizzas. “I’ve no idea whether there are any applications at all to our work outside of pizza-cutting,” Haddley told New Scientist. But he has indeed tried cutting a real pizza using this method. You can check out photo of that experiment over at the New Scientist site. How Would Football Work if You Played It on Mars? A HUMAN COLONY on Mars will need several things: air, water, protection from radiation, and football. OK, maybe the colonists wouldn’t technically need football, but they will probably want it. Mars isn’t just a red desert, though. It has lower gravity and a less dense atmosphere. And both those factors would make football very, very different than the game we play on the Big Blue Marble. If you move to the surface of Mars, those factors obviously change. Mars has a mass that is just 0.107 times Earth’s and a radius of about half of Earth’s. The combination of these two differences produces a gravitational field about a third of what you grew up in, presuming you grew up on Earth. So a person who weighs 700 newtons on the surface of the Earth (about 157 pounds-force) would weigh only 265 newtons on Mars. You wouldn’t just feel lighter; you’d also run differently. Think of running as a bunch of tiny jumps—since both feet are off the ground at the same time; otherwise it would be speed walking). 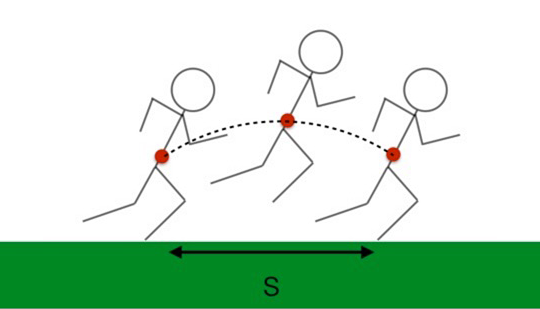 Let’s say that a human takes a stride with an initial velocity v at an angle of θ. Using some basic projectile motion equations, you can find the distance this object (or human) will travel over level ground before coming back to the surface. Here s is the distance traveled and g is the gravitational field. 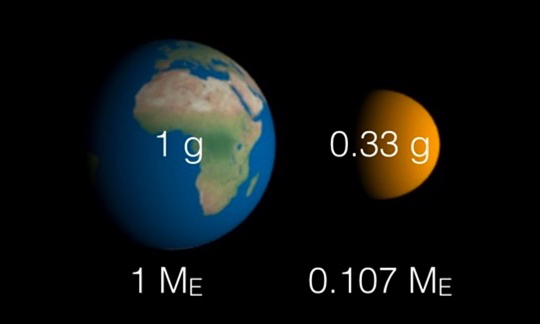 As you can see, decreasing the gravitational field will increase the distance traveled. On Mars, with a gravitational field 1/3 the value, a runner with the same starting velocity and angle would travel 3 times as far. Note: I am making some assumptions about how a human would move in lower gravity. Of course, the assumption that the human would launch with the same velocity and same angle as on Earth probably isn’t true. Still, it’s a good place to start until people actually get to Mars and see how humans move there. But what does that have to do with football? Well, of course running plays would look different, but I think that would have a large impact on gameplay. When a player takes large strides in the air, they can’t turn. In a normal game on the surface of the Earth, players come in contact with the ground quite often. During these interactions, the player can push on the ground to either change his speed or direction. Off the ground, the player has no control over his motion. He or she would be like the ball once it leaves the quarterback’s hand. A player off the ground for an extended time would be vulnerable to mid-air collisions. I wonder if this would lead to an increase in fake runs. You see this in the NBA, where players with the ball fake jumps to get the defender to jump. Defenders in the air is mostly useless; they can’t change direction. But wait, there’s more. If we assume the Mars Football League players can throw the ball just as fast as on Earth, then their range would also increase by a factor of 3. If you could throw it 50 yards on Earth, that would be about 150 yards (ignoring air resistance) on Mars. If you’ve read this far, I probably don’t need to remind you that the distance from one end zone to the other is 100 yards. Assuming the same jumping speed, a person on Mars could jump 3 times higher. That is a serious jump. Consider the interception possibilities. Maybe on Mars they should just use a bigger field. You can’t just go for a stroll on the surface of Mars—at least not without a space suit. The primary role of these suits is to put the human inside an atmosphere closer to the chemical composition and pressure of the atmosphere on the surface of the Earth. For spacesuited humans, this pressure is something greater than 0.06 that of the Earth’s atmosphere. This value is called the Armstrong limit, the pressure that water would boil at the temperature of a human body. The atmospheric pressure on the surface of Mars is just 0.006 times that on Earth. Wear a pressure suit. But…existing pressurized suits are difficult to move in—not just because of their bulk but because of the pressurized air inside. Let me demonstrate with a thought experiment. Suppose you look at just the arm of an astronaut inside a pressurized space suit. Now, for some reason, the astronaut bends the arm. What happens? Take a look at this illustration (from a previous post on spacesuits). 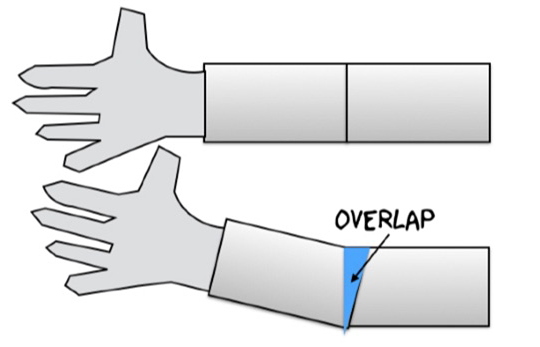 In order to bend the arm, the total volume of gas inside the spacesuit must decrease. This takes work on the part of the human to compress this air—and it isn’t as easy as you would think. One solution might be to create a constant-volume suit such that moving arms and legs does not change the volume of air inside. That’s a hard-shell suit with rotating joints. NASA has created several versions, like this AX-5 model. None have made it to space. The second (and probably better-looking) pressure suit design uses some type of tight material that pushes on the outside of the human body. It would be like a very tight wetsuit, but more complicated. The tight material would take the place of the higher-pressure air and keep the human happy and alive. Of course, if the suit is too tight in some spots it could cut off blood circulation. Too loose, and you get boiling blood. On top of that you would need something in place to regulate temperature and block the deadly radiation that’s part of the fun on Mars. 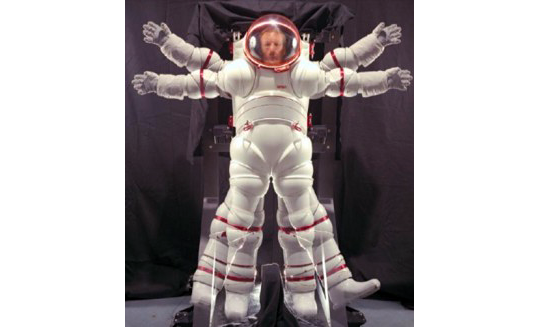 In the case of a football spacesuit, you also have to worry about collisions damaging the life support system. Getting a hole punched in your suit would result in more than just a 15-yard penalty. Another possibly solution: What if all the football players just shared one giant pressurized suit? We could call this giant suit a “football dome.” Actually, this would make the construction of such a building a little bit easier. Instead of using mechanical structures to support the roof of the dome, it could just be “blown up” like a balloon. You’d just need to make sure it was long and tall enough to hold the players who are jumping so much higher, and taking such long strides. Now that would be a Super Bowl. YES, THIS IS the final season of the MythBusters. 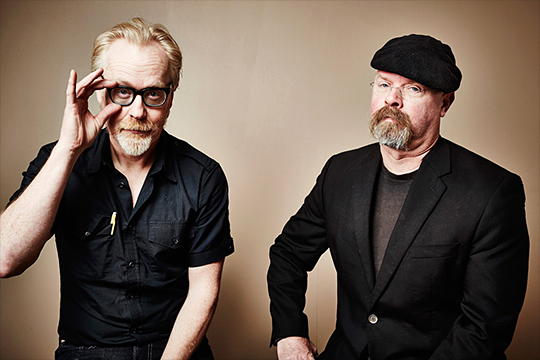 The greatest part of the show is the fact Adam Savage and Jamie Hyneman aren’t scientists but they still do some awesome science. They show us that everyone can do science—the MythBusters simply have better building skills than most of us. 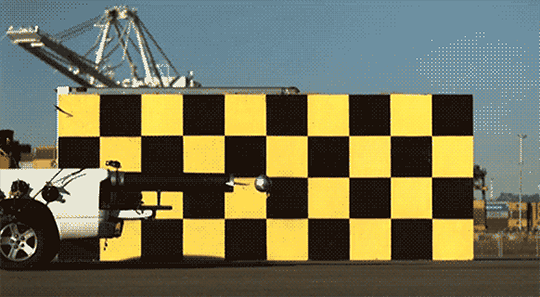 As a physics educator, I’ve been impressed by the excellent physics demos the MythBusters make. Some of these are classic examples straight from your physics textbook and some are surprising results that no one expected. Let’s take a look at a few of my favorite examples from previous seasons. When we are looking at projectile motion, the vertical and horizontal motions are independent. In fact, if you shot a bullet horizontally and dropped a bullet from the same height, the two bullets would hit the ground at exactly the same time. The instructor may then proceed to show you, using some small balls at low speed instead of real bullets. But would it work with a pistol? As you can see above, the answer is “mostly yes”. In the high speed video, the dropped bullet hits just slightly ahead of the fired bullet—a time difference of just 39.6 milliseconds. Honestly, this is close enough for me. But what if you include air resistance on both bullets? Do they still hit the ground at the same time? The answer is no. The dropped bullet will hit the ground first. Here is a more detailed explanation of why that happens. The short version is that the fired bullet has much more air resistance and this produces more vertical air drag than the dropped bullet. The band Led Zeppelin was possibly first named Lead Balloon because everyone knows a balloon made of lead would fall out of the sky. But it is possible to make a lead balloon float. But how does it work? Whenever something is displacing either a fluid or a gas, there is a buoyancy force on that object pushing it up. This buoyancy force depends on the density of the fluid or gas and the volume of the displacement. For many objects—like a car or a human in air, this buoyancy force is too insignificant to matter. If you take a simple party balloon, it has a significant volume and very little weight so that it can float. The trick to making a lead balloon float is size. Think of a balloon as consisting of two parts. First, there is the filling gas—almost always this is helium since it has a density lower than air. Second, there is the “skin” to contain that gas. For a party balloon, this skin is rubber or something, but the MythBusters use lead. Why does size matter? If you double the radius of your balloon, you increase the volume by a factor of 8 (radius cubed) but the area of the skin only increases by a factor of 4. So making a bigger balloon increases the lift (from the volume) faster than it increases the weight of the skin. The MythBusters achieved this floating lead balloon by making it a cube with sides of 10 feet. Of course, you could probably even make it smaller and still float—here are my detailed calculations of the smallest possible floating lead balloon. A car is traveling at 50 mph. Would it do more damage to crash into a brick (and unmoving) wall or a head on collision with a similar car also traveling at 50 mph? Most students would say that a head-on collision is worse than crashing into a wall. 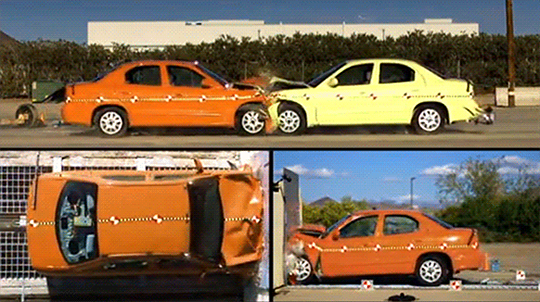 The thinking is that there are two cars in the head-on collision so it should be twice as bad. If it is indeed twice as bad then it should be the same as one car traveling at 100 mph crashing into a wall. But it’s not. Consider one car traveling at 50 mph crashing into a wall. The car goes from 50 mph to 0 mph over some time interval. This means the car has a change in momentum due to some external force (from the wall). Now switch to two cars crashing head on at 50 mph. Both cars still go from 50 mph to 0 mph so they each have the same change in momentum (but in opposite directions) requiring the same stopping force. What about a car at 100 mph? Yes, this car would have double the momentum of a single 50 mph car. However, it would have 4 times the kinetic energy of a car at half the speed. As you can see from the MythBusters episode, crashing one car at 100 mph is way worse than a head-on collision between two 50 mph cars. Yes, Humans Actually Landed on the Moon. It is hard to believe that some people think it would be easier for hundreds of employees to keep their mouth shut about a fake moon landing than it would be to actually land on the moon—but there are those that think this. In this episode of MythBusters, Adam and Jamie tested theories about the moon landing being an elaborate hoax. The first deals focuses on a picture, shown above, of Buzz Aldrin in the shadow of the lunar lander. Conspiracy theorists argue that because Aldrin is in the shadow, he should be all but dark because the sun is the only light source. This is of course wrong because light also reflects off the surface of the moon and onto the astronaut. What makes this episode so awesome is the attention to detail in the recreation of the Aldrin image. 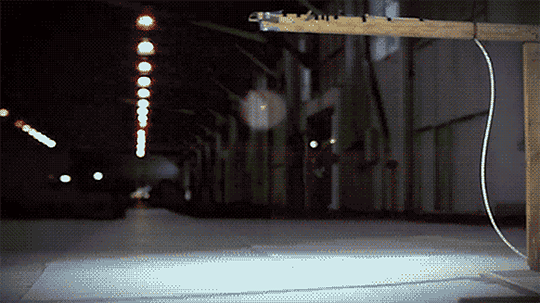 The MythBusters made a lunar lander and a replica moon surface to capture a model image using a single light source. The two images are fairly close to being identical. I also like this myth because of it’s demonstration of the nature of science. Does this photo prove that humans landed on the moon? No. Science never proves anything to be true. However, it does say something significant. Suppose you have an idea (or I would say model) that this image could only be created with multiple light sources. 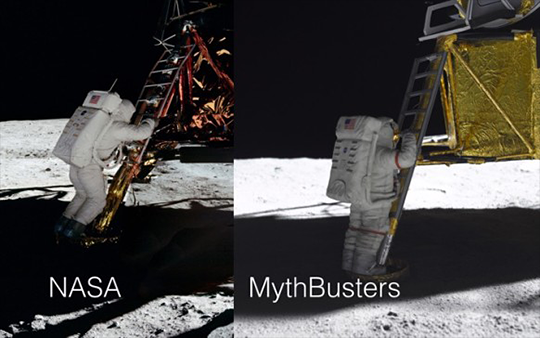 The MythBusters experiment proves this idea is wrong—since they did in fact make a similar image with just one source. So, science can prove things wrong, but not right. What would happen if you shot a ball with a speed of 60 mph from the back a car traveling at 60 mph? Would the ball remain stationary? Yup—that’s exactly what the MythBusters did. That animation is so awesome to watch. This is all about relative velocity. The speed of the ball with respect to the car is 60 mph to the right (negative) and the speed of the car with respect to the ground is 60 mph to the left (positive). This means that the speed of the ball with respect to the ground is 60 mph + (-60 mph) = 0 mph. The math doesn’t seem so complicated, but getting the relative speeds just right isn’t so simple. These are just five examples of MythBusters science; there are countless more. Perhaps I will have to share another five science explanations soon. Oh, and what about the final season? Will there be more great examples of science? I am certain there will be. It’s going to be great. One of Leonardo da Vinci's most stunning engineering plans is getting a decidedly chilly welcome to the modern world. Students in the frigid hinterlands of Finland plan to recreate one of the Renaissance man's many iconic sketches: a massive stone bridge spanning the Bosphorus River. But instead of relying on stone, the students plan to use a more local, sustainable material: ice. Leonardo da Vinci, who lived between 1452 and 1519, is perhaps most famous for painting the "Mona Lisa." But the polymath also made impressive contributions to the fields of astronomy, engineering and anatomy. In 1502, da Vinci sketched the plans for a massive stone bridge, about 790 feet (240 meters) long, that would span the strait of Bosphorus, which separates Asia from Europe. The entire bridge is subject only to compressive loads, meaning all of the elements in the bridge get shorter with applied force, according to a statement from Eindhoven University of Technology. (Most real bridges experience both compressive loads and tensile, or lengthening, forces.) Despite its graceful lines and audacious design, the bridge was never built. Now, a group of researchers and students at the Eindhoven University of Technology in the Netherlands have begun to bring da Vinci's sketches into the modern era, with an aptly named project called "Bridge in Ice." 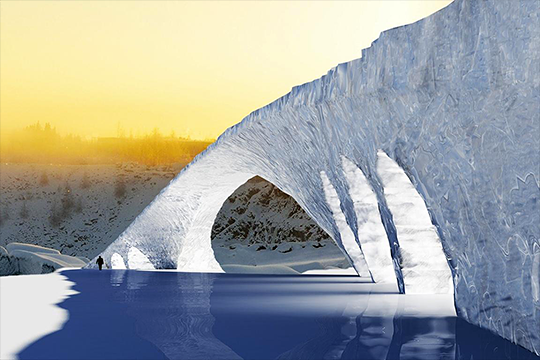 The team began construction of the ice bridge on Dec. 28, 2015, in Juuka, Finland. When it's completed in mid-February, the bridge will span 115 feet (35 m) and should be strong enough to allow pedestrians to jaunt along its icy expanse. The team also plans to test the bridge's strength by driving a car over it, Artnet reported. To accomplish their stunning feat, the team will spray thin jets of a mixture of paper fiber and water into massive balloonlike molds. When the paper-reinforced ice freezes (nearly instantly), it will be three times as strong, and 10 times as tough, as ordinary frozen water, according to the statement. "Designing the balloon is not as easy as filling a bag with air," Maarten Arntz, a student at the Eindhoven University of Technology, said in a video about the project. Given the balloon dimensions, "wind and snow have a very large influence," Arntz said. "So we made a 3D computer model to predict the forces on the balloon construction. Now, we are busy with building a stability part inside the balloon to stabilize the middle part of the balloon." The project is Herculean in its scope. The completed bridge will require 900 tons of ice, and 150 student engineers from all over Europe will help with construction. Juuka's frigid temperature of minus 4 degrees Fahrenheit (minus 20 degrees Celsius) when they started construction,is considered the perfect temperature for construction, one team member in the video said. The team can never stop working, or the equipment will freeze, according to the statement. To accomplish the task, teams will work in shifts around the clock until the construction is complete. Last year, the same group built an icy recreation of the Sagrada Familia, Gaudi's iconic church in Spain, and in 2014, the team built the world's largest ice dome. MANTUA TOWNSHIP, N.J. — Behind a Lowe’s home improvement store here, scientists are methodically scraping and sifting through a quarry pit that may contain unique insights to the mass extinction that eliminated the dinosaurs. Back then, about 66 million years ago, the oceans were higher, and this part of southern New Jersey was a shallow sea, 10 to 15 miles offshore from an ancient mountain range that rose from the water. Today’s quarry pit was once the sea bottom, and one particular layer about 40 feet beneath the surface contains a bounty of fossils. Kenneth J. Lacovara, a professor of paleontology and geology at nearby Rowan University, calls the layer a “mass death assemblage.” He believes it may be the only known collection of animal remains that dates from the mass extinction itself. It’s just a hypothesis at the moment, and a tough one to prove. Dr. Lacovara and the university, which is to complete its purchase of the quarry this month, have deployed graduate students to meticulously catalog the fossils near in time to the mass extinction. But they are not the only fossil hunters here. Once a year for the past four years, the quarry has been opened to the public, and citizen paleontologists have come in droves — about 1,500 for the most recent community event last fall. “I found a pile of rocks,” said Alexandra Hopper of Mantua, one of the participants. “When we rinse them off, we’re hoping some of them are fossils.” The diggers kept the fossils they found, and there are plenty to go around. The doomed creatures in the pit were mostly clams and oysters. But the fossils of animals like crocodiles and sea turtles are here, too, as well as the occasional mosasaur, a ferocious aquatic lizard with two long teeth at the back of its throat that pointed toward its gullet, ensuring that any prey it swallowed would never struggle out. Fossils are being found throughout the sediment that fills the pit, but the assemblage occupies a single concentrated layer. Bones and shells sometimes pile up when currents sweep dead sea creatures toward a particular eddy, where they accumulate over years or centuries. But here the skeletons of the larger creatures remain largely intact. That suggests they all died at the same time and then settled gently on the sea bottom. The dating of the fossil layer puts their deaths tantalizingly close in time to the impact of a meteor off what is now the Yucatán Peninsula in Mexico. Most paleontologists think that the climatic cataclysm that followed killed three-quarters of the species living on Earth — and all of the dinosaurs except those that evolved into birds. A seeming paradox of mass extinctions is that scientists rarely find the remains of any of the billions of animals that died. All over the world, the bones of the last dinosaurs are almost always found well below the extinction layer, which is marked by iridium, an element concentrated in asteroids and comets. For paleontologists, that is not a surprise, given the rare conditions needed to preserve fossils and the fact that world is not crammed with animals. “Kill every deer in New Jersey and then try to find a dead deer, and you’re not going to find one,” said Kirk Johnson, the director of the Smithsonian National Museum of Natural History. A future paleontologist would struggle to find a bone bed or other signs of an instant die-off, “because the square footage of animals isn’t very big compared to the square footage of the world,” Dr. Johnson said. And yet here in Mantua, there is a mass death assemblage close to 66 million years old. “It sounds silly, but is it the case that this pit in South Jersey, behind Lowe’s, has the one window into this pivotal moment in time?” Dr. Lacovara said. A century and a half ago, southern New Jersey was a hotbed of dinosaur discoveries. While scattered bones had been found in Europe, the first nearly complete dinosaur skeleton — that of an 8-foot-tall, 14-foot-long duck-billed hadrosaurus — was dug up in a quarry in Haddonfield in 1858. New Jersey became an early battlefield in the “bone wars,” the ferocious competition between two pre-eminent American paleontologists of the 19th century, Edward Drinker Cope of the Academy of Natural Sciences in Philadelphia and Othniel C. Marsh of Yale University. Cope lived in Haddonfield and collected fossils in the area. After inviting Marsh for a visit, Cope claimed that his guest paid the Haddonfield quarry owners to send fossils to Yale, not to the academy. In 1866, Cope described the bones of a meat-eating dinosaur, a relative of Tyrannosaurus rex, found in another Mantua quarry. But he and Marsh shifted their attention to grander fossil sites in the West, and New Jersey’s paleontological history faded. In recent years, the most stunning dinosaur fossils have come from places as far away as Argentina, Mongolia and the Sahara. In 2014, Dr. Lacovara, then at Drexel University in Philadelphia, unveiled Dreadnoughtus, a behemoth unearthed in the Patagonia region of Argentina. If not for the recession in 2007, the fossils in Mantua might be buried and out of reach. For the better part of a century, the Inversand Company scooped a dark greenish sand called marl from the quarry for use in water treatment plants. But tightened environmental regulations turned that business into a money loser, and Inversand started looking to close the site. A Mantua redevelopment plan called for filling the hole and building apartments and a shopping center on top. Almost six years ago, Dr. Lacovara proposed something different. He wanted to preserve the quarry, both as a dig site for paleontologists and as a museum for inspiring the younger generation. Paleontologists had long known about the fossils in the quarry and in other marl pits in the region. Inversand enthusiastically supported the idea. Bulldozers cleared out a section of the pit so that Dr. Lacovara and his students could meticulously excavate fossils, and there they uncovered the mass death assemblage. Township officials wanted to buy the quarry, but did not have the $2 million that the 65-acre site would cost. Inversand was spending several hundred thousand dollars a year keeping the pumps running to divert water that would otherwise flow in. An application for a state grant remained in limbo. And so last summer company officials told Dr. Lacovara that the pumps would be turned off at the end of the year. “That was going to be it, and the quarry was going to be a lake by mid-January,” he said. Rowan turned out to be the savior. After shipping the Dreadnoughtus skeleton back to Argentina at the end of 2014, Dr. Lacovara met with the university’s president, Ali A. Houshmand. Dr. Houshmand lured Dr. Lacovara, who was a student there when it was Glassboro State College, with a promise to create a school of the earth and environment, of which Dr. Lacovara would be the founding dean. For Dr. Lacovara, an essential part of the deal was for Rowan to buy the Inversand quarry. Dr. Houshmand agreed. 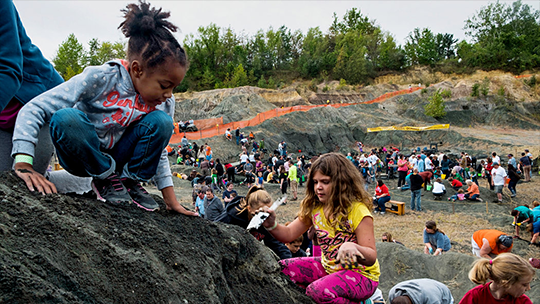 In September, crowds filled the quarry for the fourth annual community fossil dig. They arrived in four waves, at appointed times, and Dr. Lacovara greeted each group. “Who wants to find some fossils?” he exhorted. “Go have some fun.” For this day, the quarry was a scientific sandbox for people big and small. In a cordoned-off area, some of Dr. Lacovara’s graduate students continued their work on the precious layer, explaining their finds to onlookers. Elsewhere visitors scooped through the soil, presenting their finds to the experts, mostly the grad students, as if in a fossil version of “Antiques Roadshow” — except these heirlooms were millions of years old. Some were just rocks, others hardened lumps of sand that came apart when squeezed. But there were thrilling exceptions. “This is a brachiopod,” one expert told Michael Lloyd, 8, of Mantua, describing a clamlike creature. “Daddy, I found a brachiopod!” the discoverer shouted. The hope is not necessarily to produce paleontologists, but to teach young people how to decipher the mysteries of the world. As for the possibility that he has found a dinosaur-era graveyard dating to the mass extinction, Dr. Lacovara is careful to say that he does not have convincing evidence yet. But it is a hypothesis worth pursuing. January is National Mentoring Month! How are you mentoring in real life? As you may know, January is National Mentoring Month and to celebrate we are tweeting daily mentoring and Million Women Mentors highlights from each of the states engaged with MWM. Make sure you follow us @millionwmentors to keep up with all that is going on. We will be using the hashtag #MWMStates for each of our state's features. If you have an event or activity to highlight please send it to states@millionwomenmentors.org. This call will be focused on the first of MWM's Mentoring Pathways: Face to Face Mentoring. We will have a panel of representatives, including Science Olympiad, ORAU, MESA, and MasterCard, talking about their programs and best practices for in-person mentoring, and there will also be opportunities for questions from the audience. The call will be held Tuesday, January 19th, 2016 at 2PM ET/11AM PT, and we would love to have you join us. To RSVP, please contact Erika directly at Erika.Hansen@STEMconnector.org. Hear from industry experts as they share their insights and knowledge, designed for all people working in technology (both men and women alike). The goal is to get you engaged, inspired and motivated to continue in your careers in technology. We all have it - and yet we don't know how strongly it affects our relationships, interactions, and world view. "Unconscious Bias" is simply the brain's highly efficient way of processing familiar information and applying past knowledge to new experiences. That sounds great - until we get into situations that don't benefit from habitual thinking. Business strategist, leadership coach, and equality activist Ellen Leanse shares her science-backed insights into our very human "blind spots" and offers new For call in instructions and access, click here. 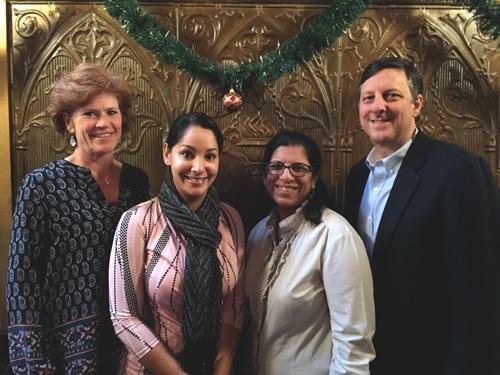 From left to right: Beth Broome - Senior Advisor to the Provost And EVC-UC Davis Stem Strategies at UC Davis, Venita Sivamani - MWM-CA Steering Committee, Sheila Boyington - National States Chair for MWM, Dr. Dane Boyington - Senior Technology Advisor for MWM. Sheila Boyington met with the leadership committee of MWM - CA to discuss plans for the state kickoff event. The team is planning their launch for January 21st 2016, an effort led by The University of California, Davis and the California Commission on the Status of Women and Girls. 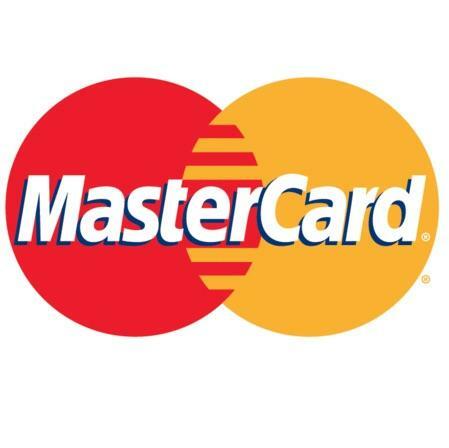 PayPal is hosting the event. If you are in the San Francisco area and would like to attend, or would just like more details you can check out the Eventbrite. Million Women Mentors is excited to have such an amazing team in California and happy to help them launch their efforts in 2016! On January 20th at 2pm EST, the Tennessee STEM Innovation Network (TSIN) along with Learning Blade® and Million Women Mentors® will be hosting a STEM Mentoring webinar for all of Tennessee. TSIN has provided a free Learning Blade License to all schools in Tennessee and this webinar will cover ways to utilize Learning Blade in your mentorship opportunities. The webinar will also feature ways to connect companies/organizations to students and schools for mentorship opportunities as well as mentor resources. If you would like to learn more or register for this webinar you can sign up through Eventbrite. 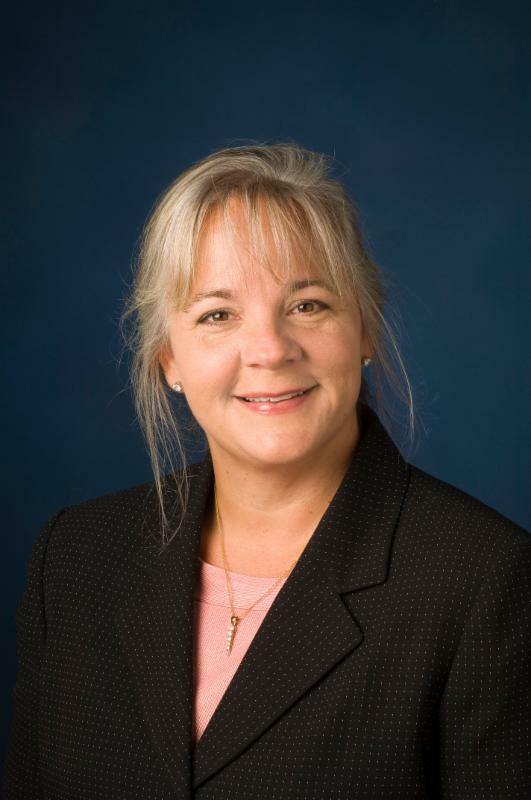 Kathleen Brandt is president of CSX Technology. She directs the information technology capabilities of CSX Corporation, a premier North American transportation company based in Jacksonville, FL, that provides rail, intermodal and rail-to-truck transload services across a broad array of markets. As the corporation's Chief Information Officer, Ms. Brandt supports CSX's strategic objectives through technology and information, and delivers tools and data to maximize excellent service and operational efficiency. Ms. Brandt joined CSX Technology in 1985 as a software developer, and progressed through positions of increasing responsibility. In 2004, she was appointed assistant vice president- applications development, overseeing creation of innovative systems that supported significant and sustained improvements in safety, customer service and efficiency. Read more about Kathleen and CSX on the STEMconnector Blog. Jennifer Andreassen, Senior Communications Manager, Global Climate, Environmental Defense Fund and Tommy Wells, Director of the DC Department of Energy and the Environment and leader of the DC delegation to the Paris Climate Change Conference will be speaking on women as an underutilized resource and implications of the UN Paris global conference. Meeting is free and open to the public. 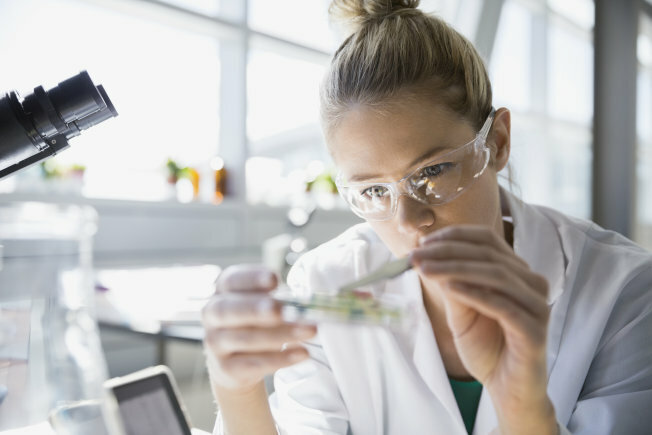 Research repeatedly demonstrates a gender bias in STEM, but some faculty still don't believe it. The gender gap in science, technology, engineering and mathematics in the U.S. is well documented. Men earn more STEM degrees than women at every level. Even worse, the gap doesn't seem to be decreasing. If that wasn't bad enough, researchers have given us another reason to shake our heads at the STEM field. Already, studies have found systemic biases against women in STEM including hiring decisions for lab positions, selection for mathematical tasks, evaluation of research abstracts for conferences, research citations, invitations to speak at symposia, postdoctoral employment and tenure decisions. But all this research likely isn't reaching the people who need to read it most. Ian Hadley of Montana State University and his team found that male STEM faculty are less likely to believe such research, leading them to ask a rather depressing question: "How can we successfully broadened the participation of women and minorities in STEM when the very research underscoring the need for this initiative is less values by the majority group who dominate and maintain the culture of STEM?" Read more here. Gwen's Girls is about female empowerment and bright futures, but sometimes girls just want to have fun. At the North Side Center, younger girls race around desks in a game of tag, braids flying. Older girls, dodging the game, carry their dinner trays to an adjoining room where they pull seats into a circle for a more serious discussion. Kathi Elliot watches as they settle into their evening routine. "My mother set me up for this," she says with a knowing smile. Indeed she did. Elliot is the daughter of the late Gwen Elliot, a resilient woman who dedicated the later years of her life to lifting up the lives of the young women of color she saw cycling through the court system. Her mother understood all too well the challenges faced by young women growing up in broken, impoverished families. 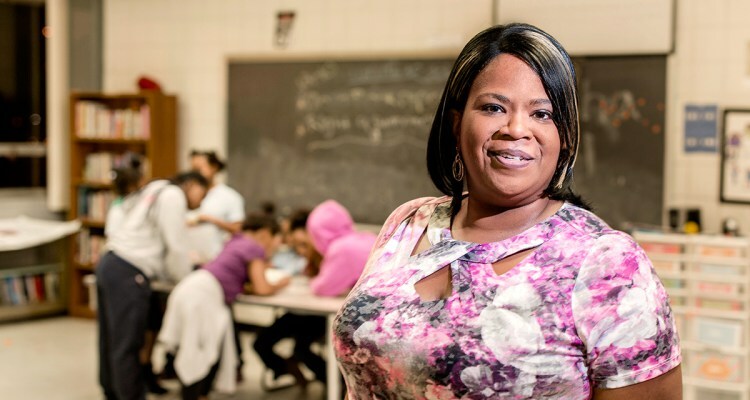 Born and raised in West Mifflin, Gwen Elliot's own mother died when she was five. Raised by her maternal grandfather and step-grandmother, she grew into a young woman of indomitable spirit, turning barriers to dust as she rose the ladder to success in a field traditionally held by men. Read more here. A recent report by the Organisation for Economic Co-operation and Development (OECD) took a comprehensive look at gender differences in student performance based on an exam taken by 15-year-olds. The report found that, although girls often perform better than their male peers - staying in school longer and out-performing them in reading - the top-performing girls continue to lag behind top-performing boys in math and science. The survey report explores possible reasons behind this gap: Importantly, girls report having lower levels of confidence in their math abilities and experience higher levels of anxiety when performing math-related tasks than boys. A higher percentage of girls agreed with statements such as "I get very nervous doing mathematics problems," and "I worry that I will get poor marks in mathematics." This suggests that girls' low level of confidence in their math and science abilities could impact their performance in school and, ultimately, result in their underrepresentation in STEM jobs. Read more here. Million Women Mentors supports the engagement of STEM professionals (male and female) to serve as mentors for girls and women middle school through careers, allowing them to persist and succeed in STEM programs and careers. MWM is an initiative of STEMconnector in collaboration with over 45 corporate sponsors, 60 partners and 35 state leadership teams.